Unsurprising discovery number one in the 2015 24 Hours of Le Mans’ first six hours: the pace scenario has been blistering between Porsche-Audi, unsurprising discovery number two, a super competitive battle brewing in both grand touring divisions. That does not mean though that some shocking moments have also been lay out in the early stages of the 83rd running of the Grand Prix of Endurance. In the battle for overall honors, three different cars have held the number one position at some point at the 8.45 mile Circuit de la Sarthe since the 3 p.m. local time start of the race. As of 8:45 p.m. local time (2:45 p.m. eastern U.S. time), the No. 9 Audi of Felipe Albuquerque held a 30 second lead on the No. 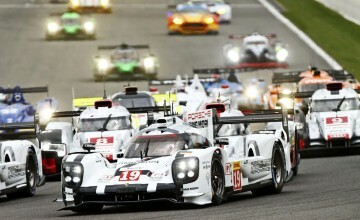 17 Porsche of Mark Webber. 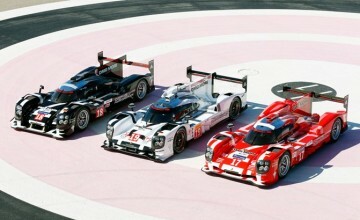 The red-liveried Porsche 919 Hybrid had held the lead for a majority of the race, but Albuquerque jumped to the top of the leader board on the strength of three outstanding stints, including an amazing 3:17.647 lap, the fastest race ever lap run in the eighty-three runnings of this event. The No. 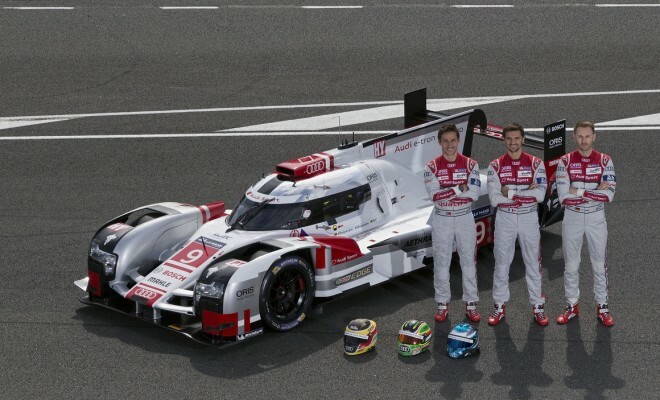 7 Audi E-Tron Quattro was third, followed by the other two Porsches, the No. 19 ahead of the No. 18 car, which won the pole position on Wednesday. The third Audi Sport entry, the No. 8 is running sixth, despite losing time due to a crash at the Indianapolis curve, which brought out the second of the two safety car periods during the race to date. In LMP-2, it has been a tour de force for the brand new ORECA 05 coupe. The latest challenger from the shops of Hugues de Chaunac has held the lead since the start, thanks to the efforts of the Hong Kong-based KC Motorsports Group. The No. 47 Nissan-powered entry with Matt Howson at the wheel held a comfortable one minute plus advantage on the other ORECA coupe in the field, belonging to the Thiriet by TDS squad. The French connection does not end there. Murphy Prototypes running the older open topped ORECA 03R spyder is third in class, with the re-badged Alpine A450b former ORECA run by Signatech in fourth. The action has been non-stop in the GTE-Pro category as the lead has been a hot potato between Corvette, Aston Martin, and Ferrari. At time of press, Fernando Rees held the top spot in the No. 99 Aston Martin Vantage V8, with the sole Corvette in the field in second with Jordan Taylor, and the AMR “art car” of Darren Turner running third. Porsche Team Manthey’s Jorg Bergmeister is currently fourth in the lone remaining 911 RSR. The sister car brought out the first safety car period of the race when it burst into flames at the Dunlop Chicane. Driver Patrick Pilet managed to get out of the burning machine, without suffering injury. Aston Martin Racing also holds the lead spot in the GTE-Amateur division, with Mathias Lauda holding a 90-second advantage on a pair of Ferrari 458s belonging to SMP Racing and AF Corse respectively. American-based Riley Motorsports has also been impressive so far, with their Dodge Viper GTS-R running in fourth. Stay tuned to Rubbings Racing for our next update at the halfway mark of the event and follow @MattEmbury on Twitter for updates throughout the race.